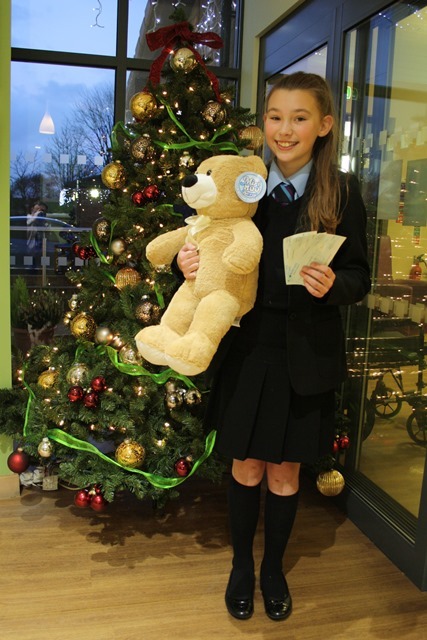 An incredible fundraising effort from a local schoolgirl has raised exactly £1,000 for Woodlands! 12-year-old Olivia, who attends Deyes High School, organised raffles, movie nights and collections over a number of weeks to raise money in memory of her grandad Mervyn, who was cared for at the Hospice earlier this year. Olivia came into Woodlands earlier this week to hand over cheques and cash which amounted to exactly £1,000. She arranged a food hamper raffle at school, after visiting a number of local shops in Maghull's Central Square with her friends, Anna and Olivia, to ask for contributions. She also organised a movie night, with pizza donated by the local Domino's and arranged a name the bear competition. Further donations also came in via her dad, Dave, who ran the recent Liverpool Santa Dash and when local pub the Great Mogul discovered she was just short of her £1,000 target, they agreed to donate the £50 difference. Olivia and her family will now be adding a leaf to the Hospice 'Tree of Life' to remember grandad Mervyn. "We are always grateful for all the efforts people go to to raise money for Woodlands, but when that effort is made by someone so young it makes it even more special," said Carole Riley, Individual Giving Manager at Woodlands Hospice. "Olivia has done a fantastic job and I'm sure her family and school will be proud of her achievements, as we all are." If you know someone who has gone the extra mile to raise money for Woodlands, or are interested in organising any fundraising activities, please contact Carole Riley on 0151 529 4143 or at carole.riley@aintree.nhs.uk.